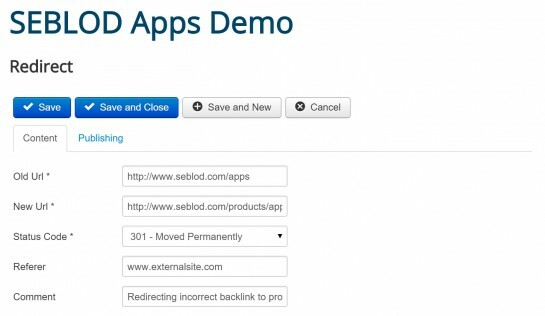 The redirect manager app gives you control over managing URL redirections within your site. Through this app, you'll be able to add redirections from old URL's to new URLS using a number of different redirect status codes. Custom redirects can be managed through the redirect app front or back end managers. To add a new redirection, click "Add New" in the redirection manager. Enter the old URL and new URL in the allocated fields. The old URL must be a URL on your website, otherwise it will not work. Enter the name of the website that links back to old URL in the "referrer" field. After saving your redirect, the old URL you entered will be redirected to the new URL using the status code you selected. You will also find the redirections that you've added in the Joomla back-end redirect manager.